Here at Cheap-price.net we have Fired Up! at a terrific price. The real time price may actually be cheaper- click on the 'Buy Now' above to check the realtime price of Fired Up! at Amazon.com. Customer Review of Fired Up! There are "BEST of 50s" "BEST of 60s" 70s,80s CDs out there; This is one of the first 90s collection CDs out there. Basically it's 2 CDs with the songs from mid to late 90s. Not much to say since the song list is in front of you along with the samples. As you can tell, most of the songs are pop and techno. If you lived through the 90s, you will find this CD enjoyable. You've seen the TV commercial for it, have you? I knew this is something I wanted, and naturally I bought it and I like it. I like it because it has dance songs of the late 90s and because I'm a huge freak of techno music. If they released "Pulse" five years after it's release date in 2001, these would be the songs on "Pulse". 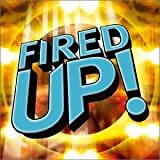 "Fired Up" has songs like "Better Off Alone" by Alice Deejay. I loved "Better Off Alone". It was my number one song in 2001. I wonder what happened to Alice Deejay. They should've released another new album. Where's Alice Deejay now? Jocelyn Enriquez's "Do You Miss Me" is in it. There's a part in the song where the drums and synthesizers change which sounds like it's in a mixed compilation. Remember that this isn't a mixed compilation. I still like it. There's also Ultra Nate's "Free" her biggest hit. Ultra Nate is her real name, (Really, it is) did you know? And there's the Bucketheads' "The Bomb", possibly the most cartoonish house song in the mid 90s and I love it. "This Is Your Night" by Amber is in it. She's one of the very first Euro divas to make an impact in the US. This was the song that got me into European dance music. "Kernkraft 400" by Zombie Nation's in "Fired Up". That recognizable composition, I've heard it over in Ireland a number of times and I couldn't get enough of it. There's also "Around The World" by ATC, "I Turn To You" by Melanie C, "Barbie Girl" by Aqua, "In A Dream" by Rockell, "One More Try" by Kristine W, and more. It doesn't have the song "Fired Up" by The Funky Green Dogs even though this is the name of the album, but that's okay. I must be that predictable about house and techno. I just simply love it. Do I make the rest of the music industry sound amish? Am I that ahead of time? Anyway, this is a great album. What's next? If you were dancing at disco techs in the 90s, this album will bring back tons of memories. I really can't think of a better name for the compilation...'cause this album sure fires me up!